A very common native of waste ground, rubbish heaps, roadsides, sites of demolished buildings in towns and a variety of other disturbed situations. The plant is fairly tall, generally about 3 - 4 feet in height, with much-divided grey-silver leaves which have a pleasant smell when bruised. The flower-heads are small and inconspicuous and the whole plant has a rather untidy and unattractive appearance. 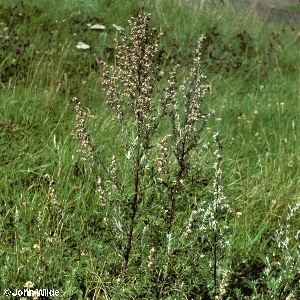 All names: Artemisia vulgaris L.